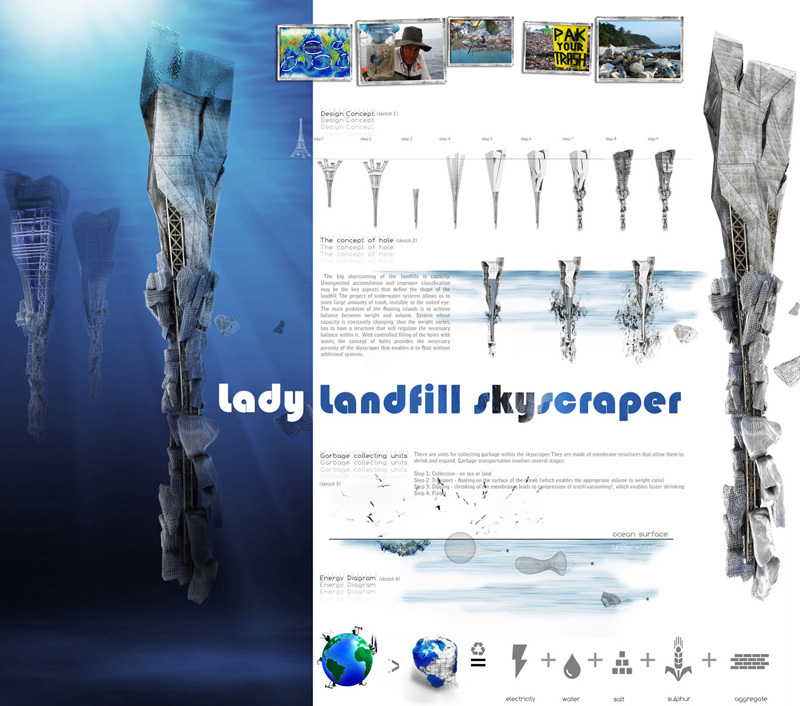 The Lady Landfill Skyscraper was an eVolo entry in 2011 designed by Milorad Vidojevic, Jelena Pucarevic, and Milica Pihler. This project is meant to act as a garbage/recycling processing plant, but also to include housing to help alleviate overcrowded cities. I think this concept is interesting because it deals with various problems in today’s society in a unique way. I find this project interesting because of how the water level is meant to change shape in order to maintain a consistent weight to volume ratio in order to stay afloat. The level changes in accordance to how much garbage is currently being stored or recycled in the lower to mid levels. It allows the interior of the building to always have a different view depending on how much water is currently inside. The part of the building that floats above the surface creates a unique and almost iceberg-esque concept, with the majority of the building being below. This could make the housing units act more like a vacation resort than actual homes, depending on where the structure is located globally. While I like the different idea for a garbage/recycler, and it’s a great way to spread the space that landfills use, I don’t know how actually effective it would be, plus I imagine it would have some serious impact on various aquatic environs. Still though, the form is nice, and the concept is one I would love to explore. I find the idea to be interesting. The designers addressed two big issues in cities in a very unique and unconventional way. I am concerned for the ecosystems in the body of water that this would be located in. I fear that this building may harm the wild life living below sea level.